Margaret Thompson is busy attaching tiny sewn union jacks to the thousands of trainers that come off the production line at New Balance's Cumbrian factory in Flimby. She's worked here for 30 years and, on the verge of retirement, finds it incredible that her employer is the last survivor of the once-flourishing shoe industry in the west of the county. "This factory's very important because there's not much work at all now," she says. "The industry's gone. We used to have Bata at Maryport, Millers at Cockermouth, K Shoes at Workington. They've all gone." So what explains the continued presence of New Balance in Cumbria - turning out nearly 1.5 million pairs of running shoes and fashionable trainers a year? And how can it afford to be the last remaining sports company to manufacture its own footwear? All of its rivals have outsourced production to cheaper factories, mainly in the Far East. A clue as to why New Balance has clocked up 30 years in Cumbria lies, at least partially, with that union jack. "We currently export to 58 countries," says business development manager Liam Burns. "And there really is a cachet, particularly in the Far East, to buying footwear made in the UK." So prestige becomes the selling point and wins out over price. Cachet over cost. But there's another reason that the Cumbrian factory is still in business. New Balance is privately-owned in the US by chief executive and chairman Jim Davis, who is something of a philanthropist and champion of manufacturing. The company has six factories in its home country. "New Balance's owner is absolutely committed to domestic manufacturing," says Mr Burns. "He cares passionately about our workforce here, as well as in the US, and that commitment was shown by Jim Davis flying in from Boston to celebrate our 30th anniversary in Cumbria." That's not to say that New Balance doesn't use sub-contracted factories itself. Production can be found in China and Vietnam. The company says that's explained by high demand for its shoes, a demand that can't be fulfilled by domestic manufacture alone. And demand has been soaring. In 1994, New Balance made 70% of its shoes in the US. Today it's thought that more than 75% of its shoes are made overseas, specifically in Asia. But, the company insists, the move doesn't have any implication for its existing factories, or for the 240 workers in Cumbria who might see those figures as being indicative of a lessening of a commitment to making shoes in the county. "We don't see that," says Liam Burns. "Our order book is full. We are currently recruiting people to make sure we are geared up to meet the increasing demand for New Balance footwear. Our sales are growing at a considerable rate, internationally." Indeed, the company is tentatively eyeing up expansion. It has bought a plot of land currently being grazed by sheep, but next to the existing factory, and hard by the Cumbrian coast line. It could be the site of a new factory, creating new jobs. Something that would be welcomed in the area, where 3,500 people are without a job. The development's not imminent, though. It's for when the current factory ups production. Two, then possibly three, million pairs of trainers produced every year are the aspirations in Flimby. And according to those on the shop floor there is the appetite in this part of Cumbria to become even bigger. Andrew Renwick, who has worked in the factory for more than two years, is currently ensuring the finished trainers are blemish-free but has ambitions to become a team leader, and can see why the business might expand. "The factory has a good reputation. 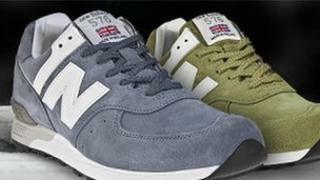 People request New Balance made in England, which is fantastic because that's us," he says. "As long as our factory is booming and we're doing a good job things will be alright."